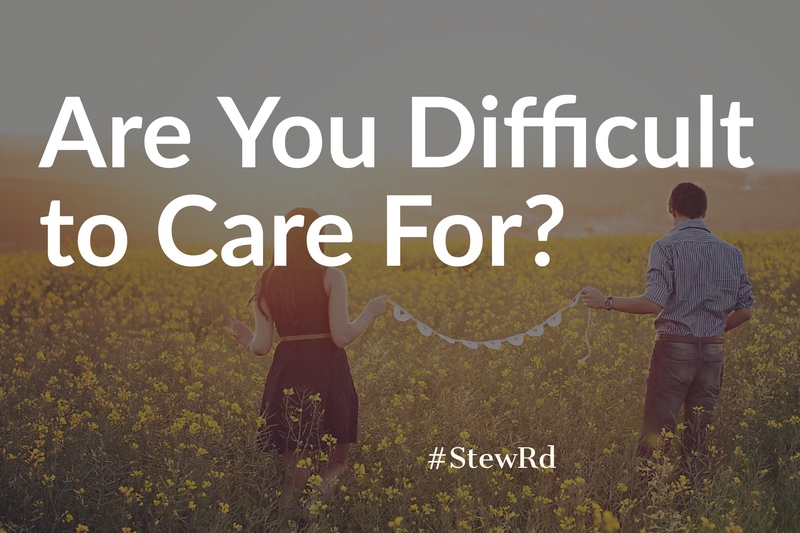 Are You Difficult To Care For? – Stew Rd. I had a bad Monday. I was tired, overwhelmed by the to-do list and just wanted to find a cave on an island to scroll Facebook and sports pages for a week. I have been on a “Don’t Fight Alone” journey the past few years. As with anything, I hoped I would have mastered it in a month, but it has proved to be a much longer process. Truth is, I will be on this quest for the rest of my life. So, what are some ways we make it difficult to be cared for? Do I even know what I need? I’m not talking about your boss getting fired or a week on an island, although some R&R might be in order. I am talking about the needs inside of you, not circumstantial changes that we have little control over. Many of us don’t ask for help because we can’t accurately identify what we actually need. One of the things that began my “don’t fight alone” journey was the simple realization that I, and others, had legitimate needs. We are not indestructible machines without needs or weakness. Identifying what we need is giving people an accurate target to aim for and hit the mark. It isn’t fair to judge others hearts and intentions toward us when we haven’t made them aware of what is going on inside of us. That can’t happen if we are not aware of what is going on inside us. I also want to say that “difficult to care for” does not mean difficult to love. Sometimes people just not pleasant and make it difficult to care for and help them. However, some of the most easy to love people are the most difficult care for because they won’t acknowledge their own need for care. To the person that cannot communicate the feelings and needs inside of them, everyone eventually becomes a disappointment. Want a tool to help identify what you need? I would highly recommend the 10 Emotional Needs Assessment (easier on a computer than phone) as a place to start or some of the other resources you can find HERE. 2. Do I ask for help? Father reminded me, “it’s impossible for you to put your burdens in My hands to carry if you don’t get close enough to hand them to me.” In other words, people can’t help bear anything that we aren’t willing to share. One of the best ways to help ourselves is to get help. If you tend to isolate and avoid people when the pressure is on, you are probably making it difficult in some way for people to care for you. 3. Do I recognize and thank people for their care? Have you ever made an attempt at helping or caring for someone and don’t get a thank you or, even worse, get a harsh response? One of the ways we make it a joy for people to care for us is to recognize when they are giving care and thank them for it. They may not have done it really well or even completely hit the mark, but showing gratitude gives them confidence and courage to do it again. We all have made it difficult for others to help or care for us at times. Recognizing it will go a long ways to making it easier to be cared for. Have you ever had a time you tried to help or care for someone but they denied or rejected your attempt to help? How did you respond? When you are feeling pressure or overwhelmed, would you say that you know how to give people a clear target or path to help you if they want to? Have you ever taken the 5 Love Languages or Emotional Needs Assessment? Do you consider yourself difficult to care for? Why or why not? Do you let people know when you need help and what you need? Why or why not? Check out Embracing Grace for more about vulnerability or Don’t Fight Alone blog. So true. Appreciate your transparency and the lessons you are learning. Good stuff! Thank you, Craig. I like you. It’s a good thing to recognise the voice of the Shepherd. Her knows all we need and he cares for us beyond out imagination. We should learn to yield ourselves to Him in its totality. It pays off! Yes it is! Father is trying to teach me how to better care for others and be cared for by the family of God as well. That’s a great one! Best wishes!